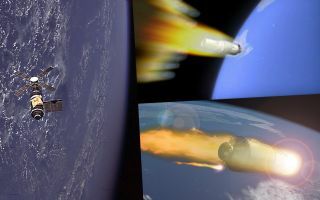 NASA’s Skylab space station (left) fell to Earth in 1979; China’s Tiangong-1 is approaching its own burn up in the planet’s atmosphere (right). China's Tiangong-1 space station is predicted to enter Earth's atmosphere sometime during Easter weekend, but the exact location of its re-entry remains a mystery. Its uncontrolled fall to Earth shares some similarities with the end of the Skylab space station in 1979; some of Skylab's pieces rained down on rural Australia. "Areas above or below these latitudes can be excluded. At no time will a precise time/location prediction from ESA be possible," agency officials said in a statement. Skylab was the first U.S. space station. It orbited the Earth between 1973 and 1979. Skylab's first crew had to perform urgent repairs to the space station when a meteoroid shield ripped off during launch, but the station proved to be a success. It hosted three space crews whose members performed science experiments, including one group of astronauts who remained on the station for a then-record 84 days. Since the station was falling to Earth anyway, NASA elected to try to control Skylab's re-entry as well as it could. The agency, which could still communicate with and direct the space station prior to its re-entry, aimed Skylab to a location approximately 810 miles (1,300 kilometers) south-southeast of Cape Town, South Africa. Skylab broke up faster than expected, however, and parts of it fell in Australia, east of Perth. The end of Skylab sparked reaction all over the world, ranging from vendors hawking sarcastic T-shirts to ordinary citizens seeking reassurance from their leaders that they wouldn't be hurt. In 1979, Time magazine wrote of the upcoming event: "Thus will be observed, after a series of miscalculations, the tenth anniversary of man's proudest achievement in space, the walk on the moon." Tiangong-1 is much less massive than Skylab. Tiangong-1 is China's first space station; it launched in 2011 and was visited twice by taikonauts (Chinese astronauts). It masses about 9.4 tons (8.5 metric tons), compared to Skylab's approximately 100 tons. In an interview with National Geographic in October 2017, Jonathan McDowell, an astronomer at the Harvard-Smithsonian Center for Astrophysics, said he only expects a few small pieces of the Chinese station to reach the surface. In a May 2017 statement to the United Nations, representatives from the Permanent Mission of the People's Republic of China also said Tiangong-1 will pose little threat to Earth's inhabitants. "According to the calculations and analysis that have been carried out, most of the structural components of Tiangong-1 will be destroyed through burning during the course of its re-entry. The probability of endangering and causing damage to aviation and ground activities is very low," the statement read. China further added that it would provide a "timely forecast of its [Tiangong-1's] re-entry" and would disseminate information through the news media and the United Nations. But because Tiangong-1 stopped working in March 2016, Chinese engineers will not be able to control its re-entry. Figuring out where the space lab will fall is a complex calculation of the station's altitude, the height of the Earth's atmosphere (which changes according to solar activity) and the station's shape. The space lab will make dozens of orbits between March 30 and April 3, making it extremely difficult to determine where the station will fall. That said, much of Earth is uninhabited — making it likely that Tiangong-1 will fall in the ocean, or, like Skylab, into a remote area.